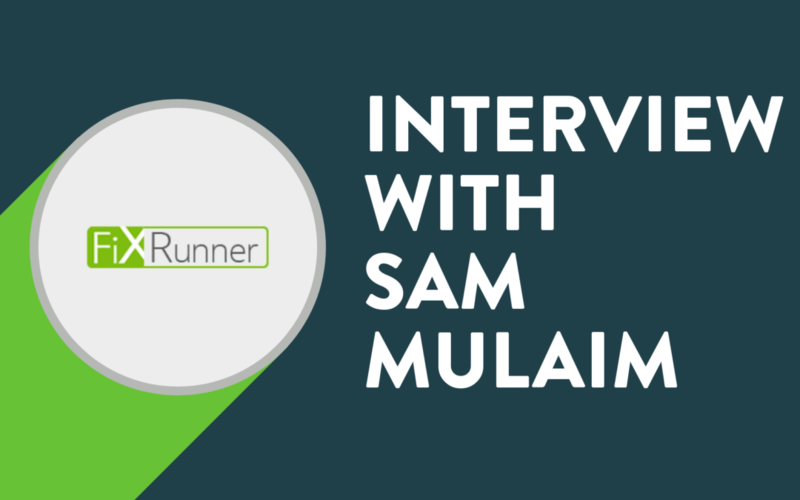 Hi Sam, tell me a bit about how you began Fix Runner? Take me to the start of your journey. When I started FixRunner WordPress Support, I knew that many people need WordPress help and that the WordPress industry is expanding, but still, I was not sure if people will be willing to get into monthly contract and pay for ongoing support and maintenance. Making someone pay you for a one-time service is easy and very straightforward but to make them commit to a monthly subscription is an entirely different story. It is known to be one of the most challenging sales. In this article, I will show you how we convert WordPress small fixes to monthly paying members. Before I start, I am sure that some of you will ask why someone would want to reveal his business model? In short, I am a great believer in that if you help others you always get good things back. Another reason is that last June I visited ManageWP office in Belgrade, and I had a pleasant experience with the team that runs that company (owned by GoDaddy). I was looking to open an office in Europe, and the guys at ManageWP gave me a warm welcome and offered to help in any way they can. For me, as a foreigner that is trying to make such a big move to a new country that meant a lot. So now that I have quality and skilled team, and the business is growing very nicely, I feel like it is time to give back and share some of my experience and help others in that business. Read this article to the end and try implementing some of the work processes with your clients- I am sure you will be able to get contracts even in the first month, so let’s start! How did you convince people to convert from one-time fix to a monthly contract module? I would say 95% of our current existing members contacted us initially with a WordPress issue or if they needed some help, most of them did not ask for a monthly contract. They only wanted to get their problem solved and move on. So, I decided to get the monthly membership in a different approach and market two things on our website, one is ongoing support and maintenance and the second is a one-time fix. I knew that most of the customers would go with the one-time fix for $49. To make one thing clear when someone just pays $49 for their fix, we lose money, with all the costs involved in getting the leads and managing this operation. But the way I see it is this: someone is paying us to show how good this service is and that it helps us make this membership sell a lot easier. There is also an additional benefit. When customers hire us for one time fix they give us the access to their website where we can see all the issues that they have on it. 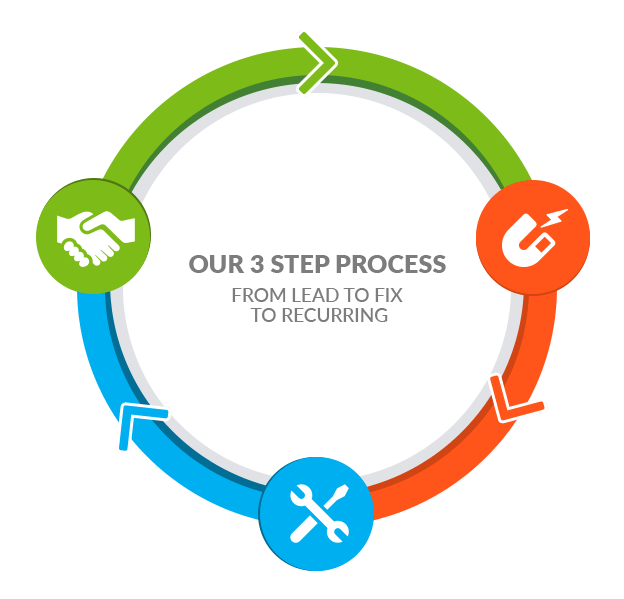 That allows us to provide the client with a full review of their website and the chance to sell more of our services and not only our one-time fix. How do you approach the issue of trust building with your clients? As I said, the customers will get to our website, and most of the time they will start by filling out a form on our one time fix WordPress page. The client info will get to our Zendesk support system, and it will send the client a reply that ticket has been opened and that we will contact shortly. The auto-reply is the first step in building your trust with the clients because they know someone is already looking into it. Other ways that people like to contact us is by live-chat and via phone. It is especially important that you will be available by telephone as well, some people just prefer the old-school approach. When we get the lead, one of our support agents will reply back very fast with an email, asking for the login info we need. Then we also confirm that they know it is $49 for the fix, we tell the clients that they can pay us after we fix the issue. Paying after the successful fix is another point of getting the client trust; we are very confident in our work, and we do not want payment unless the client is 100% happy. We don’t try to sell anything on that email, and the only thing we have in mind is to deliver the fix super-fast and get the client’s trust. Not taking money in an advance and providing a fast and reliable service has a significant impact on the upgrade from one-time fix to a monthly contract. 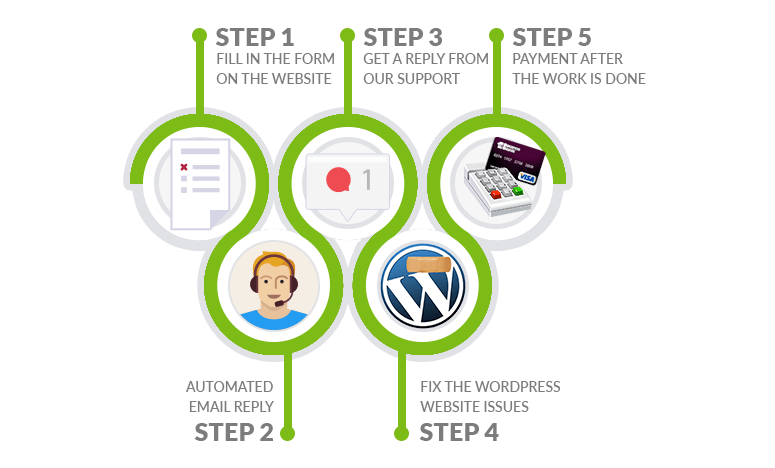 Most of the WordPress support services will take their time in replying to emails and will always ask for money upfront or at least down payment. I can understand where this is coming from and I would lie if I say that no one has ever run away without paying us. However, we are talking about a very low number of maybe 4%-5% that will not pay and just disappear. For a one-time fix of $49 that is not so bad. On every 100 potential clients, 5 will not pay, I look at this as a part of the business, If you look at this from the client’s side, they do not know who you are and if you are able to fix their website. Once you replied fast and delivered the fix before you received any payment you showed your client that you are professional and reliable. By getting that trust, you have a better chance of selling more than just the one fix. So going back to the process, we got the lead, replied back and after we get approval and login info we will start working on the fix. When the fix is complete, we reply to the client asking to check and confirm that the issue is resolved. While we are waiting for the customer’s answer, we make a report on the website issues and things we can help with. Most of the websites that are managed by people who are not developers have some problems, and you will find things you will be able to improve. The stuff we always check are things like website speed, security, updates, backups and even some improvements on the front end of the website. If you do this long enough, you will find many things to recommend your clients. Now we are coming to one of the most important steps in the process. After the client replies and approves that the fix is completed, we will send a response saying that while we did the fix, we also reviewed the website and found more things that we can help with. We also provide some examples of the things we discovered, and we ask if they would be interested in a quick phone call so we can explain more about the service and how we can help with the website. Most of the people are willing to listen and get on a short call. There we tell them about the things we can fix, and we explain that it can be done with one of our ongoing support plans and how we will be able to provide ongoing support. I assure you that most of the people care about their websites and will be willing to give it a chance, I would say that at least 50% or more of your calls will become monthly paying members. Can you throw some light on why do you have a minimum 3 months contract? There are few reasons why we only offer minimum three months contracts. I believe that if a customer stays with you for three months, it will give you enough time to show how valuable the service is. During those three months, the customer will get reports on the work we will do on the website. Also, the customer will most likely submit few tickets within the three months that will show how convenient it is just to email an issue and get it fixed instantly. Another reason why we only offer longer contracts is that the first month always carries the most work. I do not want people to join the service for one month, and after we fix all the issues on the website, they just cancel the subscription. If you want to get into the WordPress maintenance and support business, you should avoid one-month contracts. Getting your clients on a quarterly plan will help your business grow faster and increase the cash flow. To explain what I mean let’s say we sold 10 new accounts for $89/mo – that will give us $890 in that month. However, if you sold the same 10 accounts and charged the clients for the whole three months in advance, you will get $2,670 in that month. That gives you more cash flow to grow even faster, and when you start getting the renewals, you will see that your cash flow is starting to become even better. In our business model, we do allow people to pay monthly, but it is a bit more expensive than the quarterly plan, and they are still committed to the three months minimum so I can assure you from my experience that most of the people will pay for the three months in advance. Any tip for businesses wanting to convert one-time users to monthly customers? Running a 24/7 support service is not easy, especially when you start, and you do not have enough resources to hire help around the clock. So, my advice to people that are just starting to get into this business is: be willing to sacrifice a lot. For the first 8 months, I spent nearly 17 hours a day next to a computer. But it was worth because today we have 13 employees and are growing steadily. When I see how this small idea became a successful business, it makes me proud and excited about our future. Another thing that this business must have is super-fast service and good reviews. If you are not capable of being 100% dedicated to this, it will be a waste of time even to try. One of the things people like the most is to get fast replies. Many companies offer similar services, so no matter how talented you are with WordPress if you reply slowly you will lose both future and existing members. With all the difficulties of running such a business, I can say that starting it was one of the best decisions I made. I have been doing different things online over the last decade, and in the past 2 years, I decided to stop with everything else and only focus on this business. I wanted to build a company that has a steady income and gives me more room to plan for the future. With other online businesses I had, I never knew what is coming the next month and what revenue I could expect. I hope this article gave you something to think about and that it will help you sell subscriptions for your agency. Keep working hard; everything will eventually pay off.